In winter when it rains in Southern CA, there is no where to head but south and if you head any respectable distance in that direction, you would end up in Mexico. Hence, it would come as no surprise that we indeed ended up there (twice) in the winter of 2008. This trip report is actually two independent trips - thanksgiving trip to Guadalajara and a Christmas trip to Puebla, Oaxaca and Zacatecas - combined together for the sake of convenience. We spent two days in Guadalajara during our thanksgiving trip wasting the other two just getting to and from there - enough to hit all the high points of the city centre, but not enough to get to the outskirts. As this was the first trip with the baby outside of US, we were quite happy spending our time within walking distance of the comfort of our hotel. Like most of our city trips in Mexico, we started this one as well in the Palacio Gobierno (Government Palace). 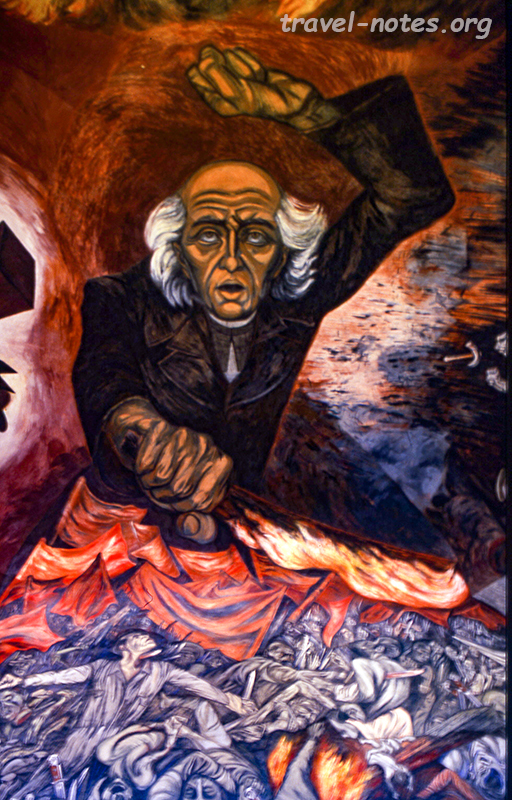 This one houses one of the most famous murals by one of the most famous painters of the city - Hidalgo brandishing his flaming torch by Jose Clemente Orozco. We spent the rest of the morning visiting other government buildings looking at more murals by lesser known artists, but none stuck in our memory like the one in the Palacio Gobierno. We ended the day in the Museo Regional de Guadalajara which houses some interesting pre-hispanic artifacts from the state of Jalisco and some intriguing colonial paintings. The highlight of the following day was Instituto Cultural Cabañas, an old orphanage which Orozco converted to his version of Sistine Chapel painting its walls and ceilings with breathtaking murals based on Mexican history. The institute itself is quite big with 23 courtyards housing a lot of changing exhibitions, but it is the main building that attracts all the attention. 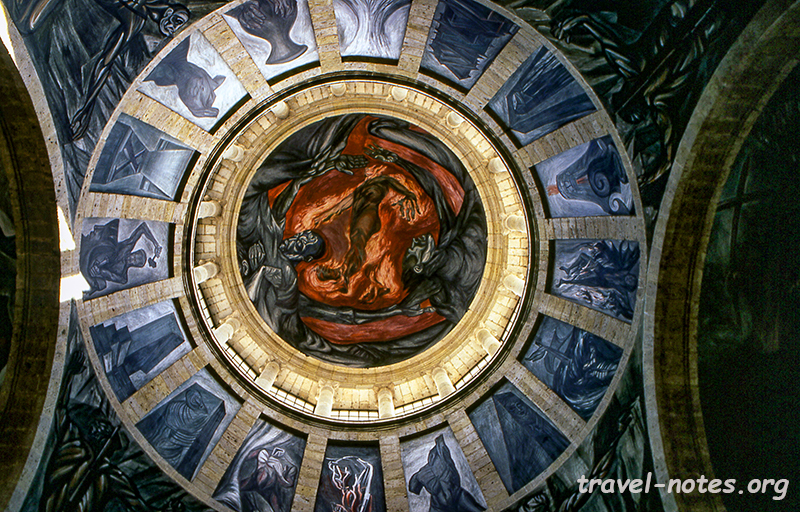 Orozco's masterpiece, The Allegory of The Man of Fire occupies the interior of the central dome of this building. This was also the place where my two year ordeal of cramming in the Spanish grammar at unearthly hours was amply rewarded when I could join (and more importantly, follow) one of the free Spanish tours of the building. With no pamphlets or placards, this was the only way to understand the meaning behind each of the frescos. Apart from gaping at the murals, we did spend some time ducking in and out of various churches of the city. Only the Templo Expiatorio and Templo de Aranzazu are worth a mention. The main exterior gothic facade of the former and the churrigueresque altar of the latter were quite stunning, to say the least. Our second leg of the winter trip started off with an equally long plane trip to Mexico City on the Christmas eve followed by a two hour bus journey to nearby city of Puebla on the Christmas day. Given that we were in a Catholic country, our trip couldn't officially kick-off till the boxing day when we took a guided tour to the nearby ruins of Cacaxtla and town of Tlaxcala. 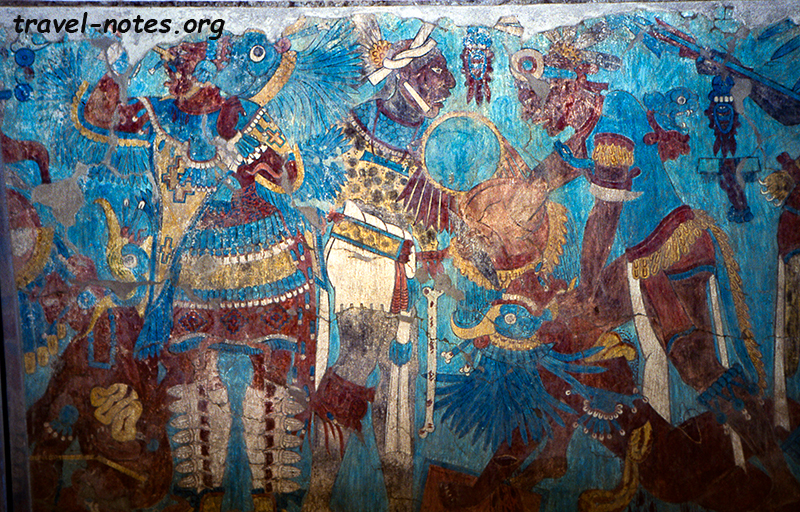 Cacaxtla is famous for its well preserved murals and the long and detailed mural on a historic battle between Eagle and Jaguar warriors were as impressive as the guide books said they would be. The site was occupied by Olmeca-Xicallanca people and flourished between 450 AD and 1000 AD. The town of Tlaxcala, the capital of the smallest state of the country, has more than its fair share of tourist attractions. 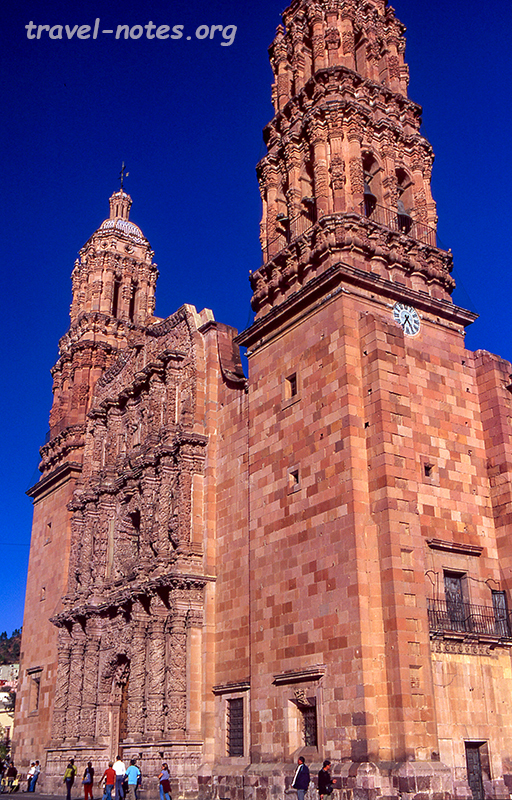 The Santuario de la Virgen de Ocotlan (where the Virgin made a miraculous appearance inside a Ocote tree) is one of Mexico's most spectacular churches and the nearby Ex-Convento Franciscano de la Asuncion does not fall very far behind. But the greatest gem of the city is hidden inside its Palacio Gobierno - Desiderio Hernandez Xochitiotzin's vivid and detailed murals on the Tlaxcalan history. After three days of travel, we decided to give the baby a break by taking a walking tour of Puebla while the baby happily slept in his giant perambulator that we had lugged along for the trip. Puebla is famous for its painted tiles and most of the buildings around the historic centre has tiles adorning its outside walls. You can just walk around the city centre and admire the art work without entering a single church or a museum. But, we however did enter every Church and Museum that will allow us to do so. Our first stop of the day was at the imposing city Cathedral - whose image adorns the 500 peso note. Its 69m tall towers are tallest in the nation. Among the other churches, the Jesuit Iglesia de la Compaña and the Templo de Santo Domingo with its supremely guilded Rosary Chapel were the must-sees. Puebla has numerous small and worthwhile museums and the top ones would be the Museo Amparo (with its great pre-hispanic art collection), Casa de Alfenique (with its great colonial art collection) and the Casa de los Muñecos (with its great collection of religious paintings). They are all of manageable sizes and we could spend enough time in each and still had time left in the day to laze in the Zocalo. Our great day in Puebla was followed by the worst day of our trip - the day we took a 5 hr bus drive to Oaxaca. When the drive was its most scenic (read most "winding"), the motion sickness of the baby found its way from the maple forests of New England to the Cacti desert of central Mexico. Baby really made a mess of our surroundings and gave us some really heart wrenching moments; but, eventually like all bad things, the drive (and hence our agony) did come to an end. A long walk in the Oaxaca city centre helped us get over the bad memory of the bus - in fact it helped us enough to prevent us from cutting short our trip and instead braving a taxi drive to the nearby Monte Alban ruins on the following morning. Ruins of Monte Alban (thankfully only a 15 min drive from the city centre) sits atop a hill with splendid views of the surrounding ranges. 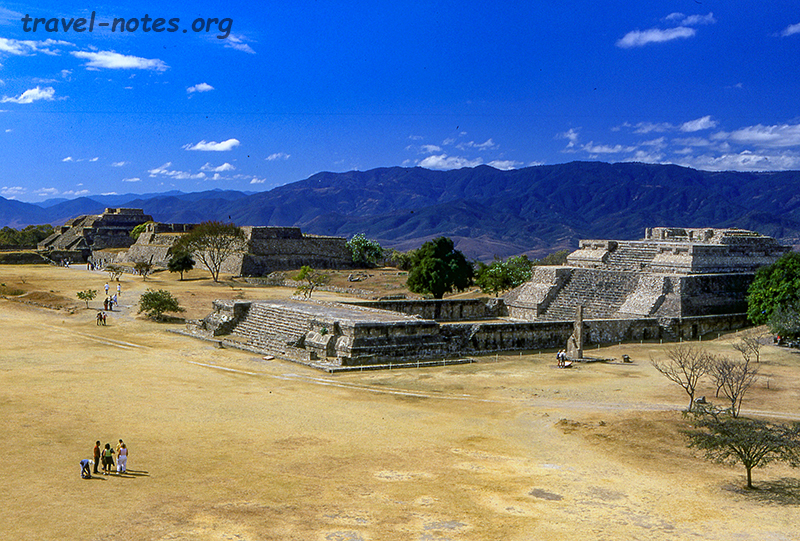 Monte Alban was occupied between 500 BC and 10th century AD although most of its grand construction happened in its second phase (between 100 AD to 500 AD). This was one of the most important Zapotec centres. Unlike Teotihuacan or Chichen Itza, the site was pretty manageable in size was surprisingly perambulator-friendly. We were also allowed to climb the two platforms at each end to get a bird's eye view of the entire site. The most intriguing part of the ruins were a series of bas-reliefs known as Danzantes - named so because it showed many figures in varying dancing postures which the researchers later identified to be losing Olmec warriors in various stages of torture! The Templo de Santo Domingo, easily the best church in the city was our primary stop on the following day. The amount of guild inside the church can easily out-bling Las Vegas. Adjacent to the church is the old Dominican monastery converted to an art museum. Apart from its share of colonial art, the museum houses some remarkable collection of Zapotec funerary vessels and ornaments from Monte Alban - the jade covered human skull is sure to leave anyone transfixed! We had our saturation of the pre-hispanic artefacts in the Museo Rufino Tamayo which houses even more pots and pans from surrounding areas - from what used to be the artists private collection! In the afternoon, I decided to give a break to my wife and son and let them sleep at the hotel while I took a taxi to the nearby ruins of Mitla (about an hour from the city centre). Mitla is much smaller compared to Monte Alban - it has only one structure worth of note - but it has some very impressive stone work, probably the best in the entire Meso-America. The following day, after the customary gaping-at-the-murals in the city's Palacio Gobierno, we headed towards our final destination - Zacatecas. We were a bit jaded by this point in the trip and were wondering if the trip to the remote silver mining town was worth the extra effort. The fact that it was new years day and all we could do was to gape at more murals in the (you-might-have-guessed) Palacio Gobierno didn't help to lift our spirits either. But a long nights sleep an open attractions of the following day did bring about a change. Zacatecas has something that that no other city had - a teleferico that takes you up to a vantage point to give you a good "uplifting" view of the surroundings. The breath of fresh air which we got on the gondola ride was soon taken away from us in the city's primary museum - Museo Rafael Coronel. 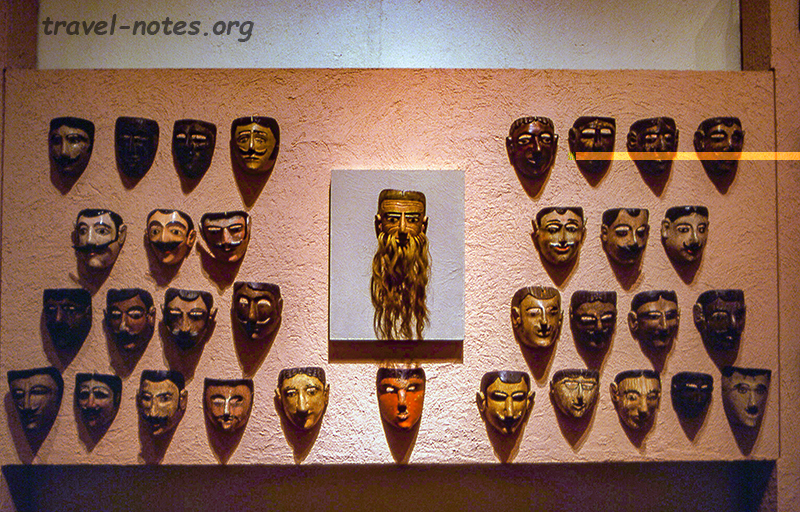 The museum housed in an old Franciscan monastery is home to an extensive collection of masks and puppets. Thousands of never ending array of faces stared back at us as we walked open-mouthed from room to room in this unique museum. The city's Cathedral whose main facade is probably the best expression of Mexican baroque also captured our attention every time we walked past it to get to and from the other attractions. On the final day of our trip, we decided to head to the nearby town of Guadalupe which houses a spectacular religious art museum. Museum contains some wonderful series of paintings on life of San Francisco and stories from the New Testament. The fact that we found it worthwhile even at the fag end of the trip should say a lot about the quality of the art work housed in there. 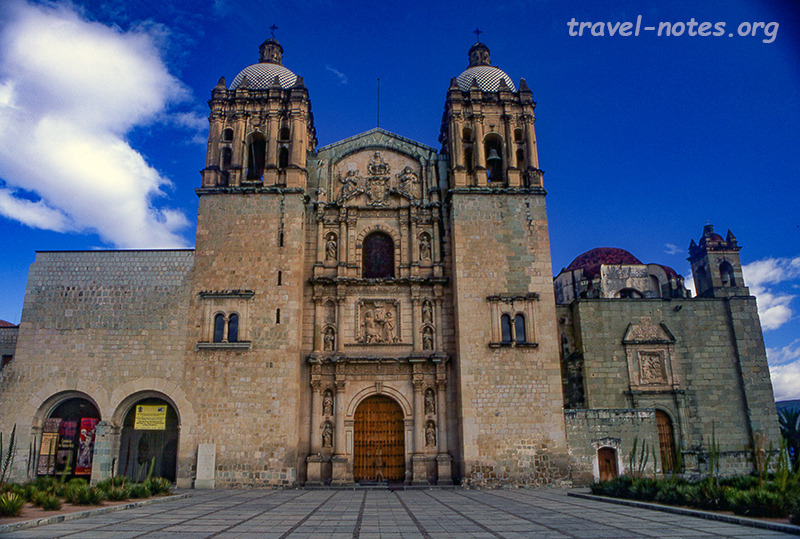 If you get this far, don't forget to duck into the nearby church to a look at the Capilla Napoles - there is no better place to finish your trip to the fascinating country south-of-the-border. It was a bit of a challenge spending twelve days travelling around a new country with an one year old. But Mexico is a kid-friendly country and the Christmas season only added to the support we got. At every point we had to carry the heavy perambulator with a sleeping baby up and down a staircase, we found an army of locals willing to extend a helping hand. In the end the experience and the sheer quality of sights really did make the entire trouble of undertaking such a trip worthwhile. Click here for more photos from Guadalajara. Click here for more photos from Puebla, Tlaxcala and Cacaxtla ruins. Click here for more photos from Oaxaca, Monte Alban ruins and Mitla ruins. Click here for more photos from Zacatecas and Guadauple.